LANSING — Efforts to conserve heat in Michigan during the extreme cold reduced usage by 10 percent following a fire at a major natural gas facility, stabilizing Consumers Energy’s ability to supply houses and other critical buildings, officials said Thursday. The utility, the state’s largest supplier of natural gas, asked its 1.7 million customers and millions of others to continue to set their thermostats at 65 degrees (18 degrees Celsius) or lower until midnight Thursday — 62 degrees if they are away from home for more than five hours. The company first made the request Wednesday afternoon. The state police later sent a late-night emergency alert to the entire Lower Peninsula, after Gov. Gretchen Whitmer consulted with emergency management staff and Consumers Energy leaders. Auto plants and other big customers shut down or limited operations due to the disruption in supply. Whitmer said she would ask state regulators to assess the supply and delivery of natural gas, electricity and propane by July 1. “In our 130 years, we’ve never experienced this kind of demand or these kinds of temperatures,” said CEO Patti Poppe. 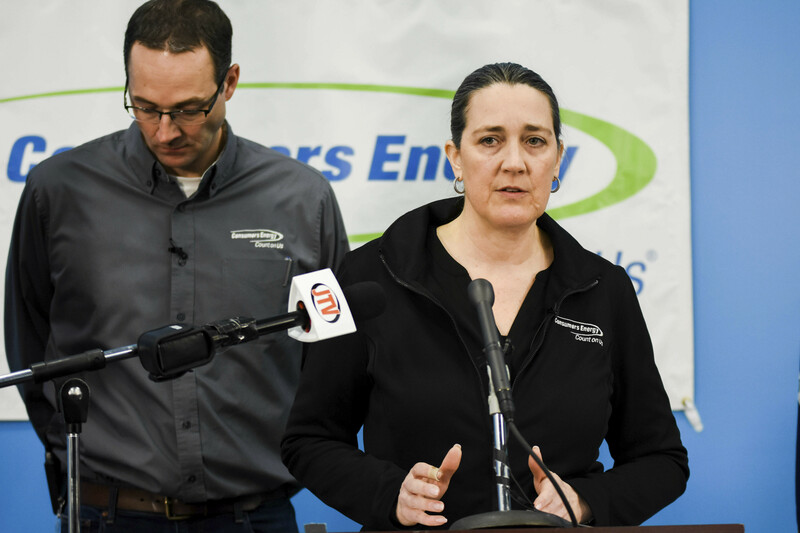 She said at a news conference that the Jackson-based utility had been prepared to supply more natural gas due to the frigid weather until Wednesday’s fire at its largest storage and distribution facility, in suburban Detroit. The company, Poppe said, was “cautiously optimistic” that its system had stabilized. The fire remained under investigation. The appeal to reduce heat drew both praise and criticism on social media, with some people saying they were happy to do their part and others expressing frustration — including with the timing of the alert that went to cellphones. “Who authorized the emergency alert network at 10:30 at night?” Republican Rep. Beau LaFave of Iron Mountain said on Facebook and Twitter. Whitmer defended the move, saying it was “very critical” to act quickly. Whitmer said she was concerned that nearly two-thirds of Consumers Energy’s natural gas is distributed from its station in Macomb County in peak periods.